The Sanitary Valves, which we manufacture, is used for controlling the flow of fluids. Ou Sanitary valve is known for its rust resistance, compact design, dimensional accuracy, sturdy constructions and high strength. Sanitary Valves is available in different sizes and thickness as per the requirements of our customers. The sanitary valve are manufactured using finest quality raw materials. Port Size 1/2" - 2"
Our Zero Dead Leg Sanitary Valves are manufactured using finest quality raw materials with superior internal finish . This fully automated value is use to regulate the flow of liquid flowing through it. This product is internally electro polished with externally raw mill finish. This product is known for its dimensional accuracy and compact design. Selection of Diaphragm - Pneumatic operated valves are fitted with EPDM+PTFE (Padded) Diaphragms as default. 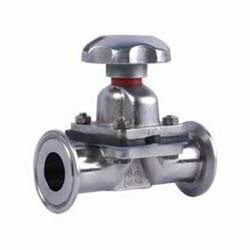 We offer an optimum quality Diaphragm Sanitary Valve to our valuable customers. This valve is equipped with high quality rubber seats such as EPDM, Silicone, and PTFE, to ensure no joint leakage. This product is used to draw out fluid through the valve. This product undergoes various quality assurance procedures at each level of its productions. This product is available at cost effective market prices without compromising on our quality. Looking for Industrial Sanitary Valves ?